He may be a heartthrob now, but that wasn't always the case as a recently uncovered photo reveals. We've all got daggy photos from our past that we hope will never come back to back to haunt us, right? The oversize shoulder pads, the bad perm, the bubble skirt, the MC Hammer pants (shudder). 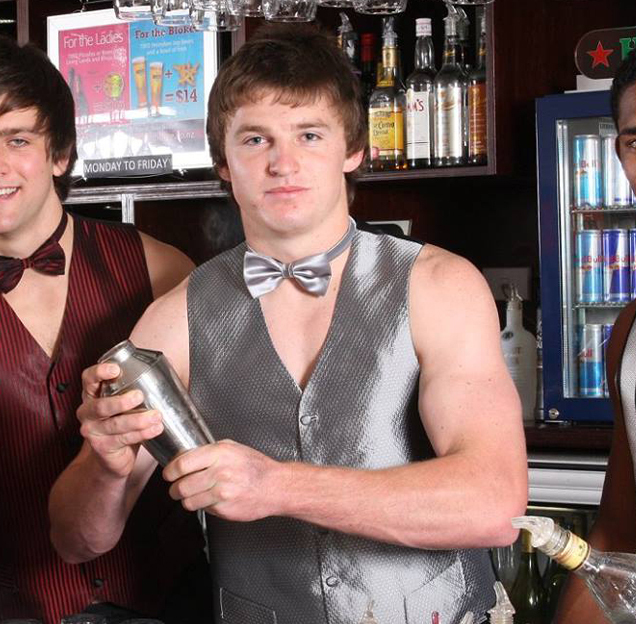 Well spare a thought for All Black pinup Beauden Barrett, who has been outed in this cringeworthy photo from 2011. Heiden Bedwell-Curtis, Beauden Barrett and Waisake Naholo as July pinups for Taranaki Rugby's 2011/2012 charity calendar. Since Richie McCaw hung up his boots, Barrett has emerged as our newest All Black heartthrob. His smouldering good looks, cheeky grin and of course prowess on the rugby field have made him a hot favourite amongst Kiwi women. But all of that is a million miles away from this photo, posing awkwardly as a barman in what can only be described as some extremely questionable attire. Barrett was a shy 19-year-old at the time and along with team mates Heiden Bedwell-Curtis and fellow future All Black Waisake Naholo, was roped into becoming a July pinup for Taranaki Rugby's 2011/2012 charity calendar. You could forgive the poor guy for hoping (praying) this photo would never see the light of day again, but it came across our desk at Now To Love and, well, some things are just too good not to share. Sorry Beaudy, we love you, but no one can make a metallic waistcoat and matching bow tie look good. We're guessing his girlfriend (now fiancée) Hannah Laity agrees. Cheers fellas. Anyone for a cocktail?